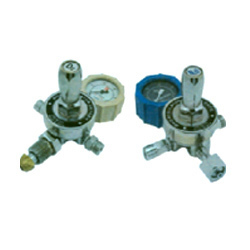 Gas Regulators have compact design and high flow capacity which made these products have high demand in industry. These save the maximum of total gas usage, light in weight and highly resistant against corrosion and abrasion. 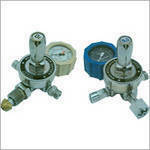 We provide these regulators in various sizes, and also as per customer's specifications. This product can be easily installed along with other air source products and can function effectively. We manufacture and supply these regulators which are valued by our widespread client base for their reliable performance, durability, eco friendly features. We are engaged in providing a wide assortment of Heavy Duty Oxygen Regulator. This Heavy Duty Regulator is widely demanded amongst our customers for its longer service life and admirable performance. Furthermore, our experts test this product properly upon distinct parameters of quality. Mounted over cylindrical valve, these precision designed and constructed Single Stage Double Gauge Regulator options find use with oxygen/anesthetic apparatus in regulating high pressure as well as for maintaining consistent flow rates. As quality color coded pressure gauge, these provide reading for cylinder as well as out let pressure and assists in maintaining it as per the defined medical norms. Some of its features include forged brass main body, extruded brass rods based components, precision designed rubber diaphragm to ensure efficient performance of regulator, presence of safety valve support for stopping high pressure buildup in regulator, volume scale for easy determining of amount of oxygen and others. Supporting the needs of reducing cylinder pressure in two steps, these latest technology based Double Stage Regulator options can be made available in exact working specifications for suiting particular applications. 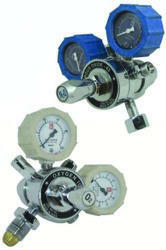 Supporting the management of droop and supply pressure variables, these regulators provide for maximum flow capacity. Some of its features include providing for constant delivery pressure with no requirement of frequent readjustments of pressure level, supports reducing pressure progressively in two stages, come with support of safety valves to safeguard from excess pressure, allowing for automatic compensation for any drop in cylinder pressure and others. Single Stage Oxygen Regulators are manufactured using standard quality materials that are procured from the certified vendors in the industry. These are used for regulating the flow of the gases like oxygen, nitrogen etc. These are available in various formats, sizes and dimensions as per the demands of the clients. These are used in various places like hospitals, nursing homes etc. 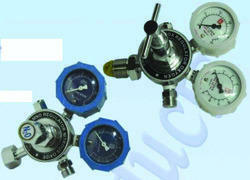 Looking for Medical Gas Regulators ?